Moreno was born to a Mexican American family in Tucson, Arizona, the oldest of 11 children of Maria and Arturo Moreno, who immigrated from Mexico. His father ran a small print shop; his grandfather owned Tucson's first Spanish-language newspaper. In 1965, graduated from high school and in 1966, he was drafted into the United States Army and fought in the Vietnam War. After returning to civilian life in 1968, he enrolled at the University of Arizona where he graduated in 1973 with a degree in marketing. Moreno soon demonstrated a willingness to spend the money necessary to sign premium players, including star outfielder Vladimir Guerrero, to improve the team. He also took a hands-on approach, becoming a regular attendee of the team's home games and periodically leaving his owner's box during games to mingle with fans in the regular stadium seating areas and concourses. All of these moves proved very popular with fans. In the first year of his ownership, the Angels drew more than three million fans, 750,000 more than their championship season. Aside from the name controversy, Moreno's first few seasons as owner of the Angels were largely successful. The team posted three consecutive winning seasons for the first time in club history (2007–2009), including winning the American League Western Division championship in 2004, 2005, 2007, 2008, 2009, and 2014 when they finished with a league leading 98 regular season wins. 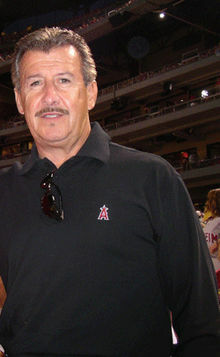 Just prior to the start of the 2006 Major League season, Moreno scored another success in signing a lucrative contract with Fox Sports Net for the television broadcast rights for the Angels' regular season games. The ten-year deal significantly increased the team's television revenue. In April 2006, Forbes magazine estimated the team to be worth $368 million—twice the amount Moreno paid for the club only three years earlier; in January 2018 Forbes estimated the franchise value at $1.75 billion. ^ "Forbes Moreno profile". Forbes. Retrieved January 4, 2018. ^ Mendez, Davis (March 4, 2013). "Tucson born Moreno among Forbes wealthiest". Tucson Weekly. Retrieved January 5, 2018. ^ Mark Boster (May 15, 2003). "Arte Moreno". Los Angeles Times. ^ Boeck, Greg (February 24, 2004). "Moreno a thorough baseball man". USA Today. Gannett. Retrieved January 21, 2010. ^ Moore, David Leon (2005-02-23). "City of Angels … and Dodgers". USA Today. ^ Lennon, David (2005-10-05). "AL DIVISION SERIES, ANGELS NOTEBOOK, What's in a name? Big bucks". Newsday. p. A70. ^ Shaikin, Bill (2005-01-04). "Angels to Be a Team of 2 Cities". Los Angeles Times. p. A1. ^ "Forbes estimates team value". Forbes. Retrieved January 5, 2018. ^ Reaves, Joseph A.; Harris, Craig & Higuera, Jonathan J. (April 23, 2003). "Baseball more than business for Moreno". Arizona Republic. Retrieved 2008-04-18.